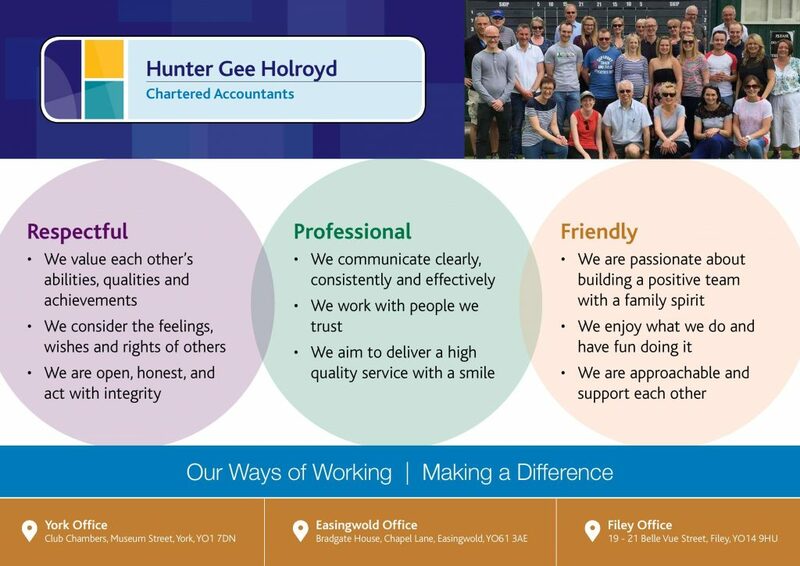 Hunter Gee Holroyd provides accountancy, taxation, business consultancy and corporate finance services to small and medium sized businesses. We have over 75 years of experience in looking after a range of businesses from small start-ups through to medium size companies. Our aim is to give a very high level of service to you, our client. We work much more closely with our clients than traditional accountants. We take time to get to know our client’s businesses inside out, enabling us to easily identify problems and spot opportunities. We want to help you to improve profits in your business and encourage growth. We consider our clients to be part of our extended family. Extremely professional, excellent service, very friendly staff, always available for help and advice. Flexible in meeting our needs and understand our business. On behalf of my fellow directors I write to thank Hunter Gee Holroyd for the assistance given in the last year. As an organisation that prides itself on the quality of advice and service we give our clients we recognise that you and your colleagues have offered top quality service and help throughout the year. Our previous accountants simply did our accounts and offered little by way of additional value. Hunter Gee Holroyd by contrast has offered proactive advice when required and added real value. You and your colleagues are always very approachable and responsive to requests for assistance and, in particular, you assisted our request for a set of interim accounts quickly and efficiently with a minimum of fuss. We therefore have no hesitation in recommending your services to anyone looking for a trusted source of business advice and assistance. Your first consultation is free so once we have established your needs we will give you a guaranteed fully inclusive price. This will give you peace of mind and no surprise bills. If any extra work arises from this initial consultation, we will give you a fixed price quotation for the extra work before it is started. We offer unlimited access to all of our team. This means that you can call on us during business hours knowing that you will never be charged for our time. We believe that we can offer a friendly, professional and value for money service that will really help your small or medium sized business reach its potential. If you’re considering moving from another accountant, but are concerned about the amount of paperwork involved, our Change Easy Service makes it easy for you, simply leave it to us! Contact us now by emailing: enquiries@hghyork.co.uk or call us, we’d love to hear from you! 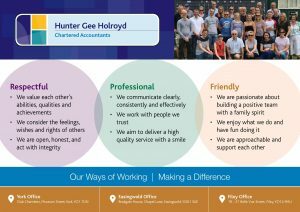 Hunter Gee Holroyd are founder members of the AVN, a national association of independent accountants committed to making your business more successful and profitable.